Decimating module to avoid flipping of faces. This module can be used only as a binary module. The criterion of allowing/disallowing the collapse is the angular deviation between the face normal of the original faces and normals of the faces after the collapse. The collapse will pass the test, if the deviation is below a given threshold. 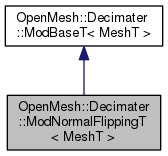 Compute collapse priority due to angular deviation of face normals before and after a collapse. Compute for each adjacent face of _ci.v0 the face normal if the collpase would be executed. Prevent the collapse, if the cosine of the angle between the original and the new normal is below a given threshold. Set the maximum angular deviation of the orignal normal and the new normal in degrees.